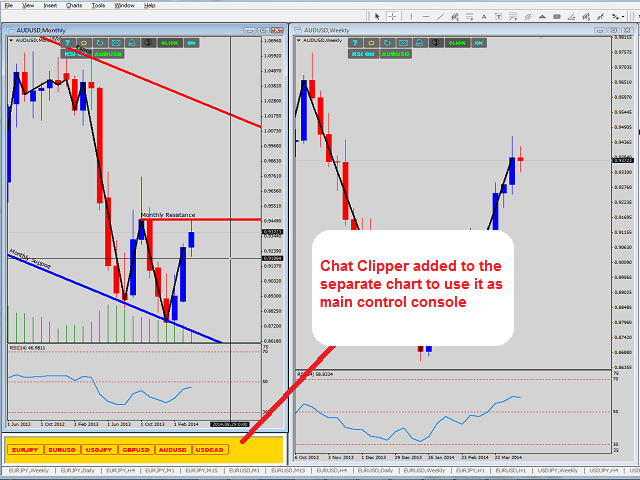 Chart Clipper helps traders to monitor multiple charts of different symbols easier and faster. You may use MetaTrader Profile option, but in this case if you have any Expert Advisor or Alert indicator on the charts, all will be unavailable till you open the profile again. Chart Clipper, clips all the charts from the same symbol name together, so whenever a trader needs to analyze a specific symbol, it will bring all the charts of the desired symbol to the top with one click. Add the indicator to the chart. Keep it as main control panel. Please refer to the screenshots. Chart Clipper designed for touch screen monitors and tablets also. Play button will switch symbol every few seconds automatically. Back Ground Color: Back ground color of the chart which Chart Clipper is attached. Play Speed: Determines the speed of automatically symbol switching when "Play" button is pressed. Show Symbol Name On Chart: To add\remove the symbol's name text to the all selected symbol's charts.